Attorney Edwin Shorty has been in private practices since 2003. He also currently serves as Constable for the 2nd City Court in Orleans Parish. A native son of New Orleans, Edwin Shorty attended (high school) before going on to a distinguished academic career at Southern University in Baton Rouge. During his undergraduate years, Ed Shorty also held down a job as Deputy Sheriff with the Orleans Parish Criminal Sheriff's office, a position he said gave him life changing insight and connection to the people of the area. 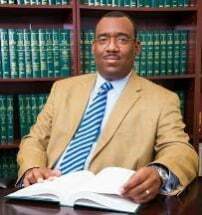 He graduated from Southern University in 1999 with a degree in Business Administration and Economics, upon which he immediately enrolled in the Southern University Law Center. During his law school years, Shorty gained valuable experience as a law clerk with several local law firms. And he would get a first-hand look at the legislative process when he served as law clerk for the Louisiana Senate during the 2001 legislative session. He completed his studies and earned his law degree in 2002. Edwin Shorty opened his law practice in May of 2003, with a focus on Bankruptcy, Personal Injury and Estate issues. His first retainer clients included the Desire Narcotics Rehabilitation Center and its sister organization, the Desire Community Housing Corporation. In 2005 Shorty brought on partners. With Shorty as managing partner, the practice thrived, delivering a very respectable $2.8 million in judgments to clients over a 7 year span. The partnership was dissolved in 2012 after Shorty decided to run for public office. Edwin Shorty won in his first political outing and was elected Constable, 2nd City Court in Orleans Parish in January, 2013. Shorty's newly formed law practice was established in August of 2012. The firm provides experienced legal representation in the areas of Personal Injury, Estate Planning, Trust Development and Bankruptcy Counsel. Mr. Shorty's professional admissions include, all Louisiana Appellate and District Courts; U.S. Fifth Circuit Court of Appeal; U.S. District Court for the Eastern District of Louisiana; U.S. District Court for the Middle District of Louisiana; U.S. District Court for the Western District of Louisiana. He is a member of the Louisiana Constables and Marshalls Association; the New Orleans Bar Association; the National Association of Consumer Bankruptcy Attorneys; the Louisiana State Bar Association; the Industrial Development Board of New Orleans and French and Montessori Education, Inc.